Permatrims.com USA is a division of Shipyard Island Marina Inc. We are located on Washington Island in Door County, Wisconsin. We are family owned and run and have been in the boating\marina business here since 1982. Besides being the USA distributor for Permatrim, we are also dealers for Yamaha outboards, Mercury Marine and Volvo Penta. We have a very diverse knowledge of the marine industry that goes a bit beyond Permatrim foils. On any given day, we may be re-powering a 16ft fishing boat or a 50ft yacht. We may be installing electronics, polishing a hull or making boat repairs and upgrades. Our facilites include a 40-slip marina, 20,000 sq. 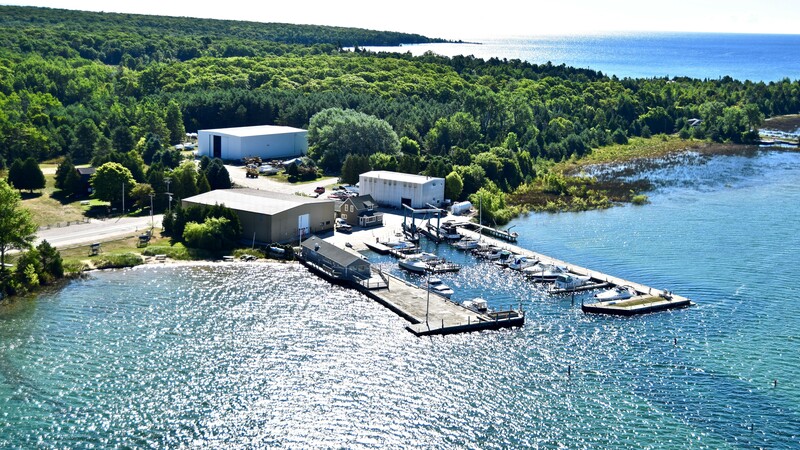 ft. of indoor heated and unheated boat storage and a dedicated 4500 sq. ft. marine repair building that we are able to drive our 70 ton Marine Travelift into. Besides our local marine business, we have 4 websites we sell various marine parts from. For our Mercury Verado customers we have www.veradoclubparts.com. To view our corporate site and see more of what we do visit www.shipyardisland.com. We are working on a Yamaha sales site and will be adding the link soon. We import Permatrim foils from the Auckland, New Zealand manufacturer Permatrims NZ. Permatrim USA is the only outlet for Permatrim in the US. Permatrim foils are the only product of its kind. Each one is made to fit a specific outboard/sterndrive and are powdercoated to closely match your engine. There are cheaper foils out there, but none match the quality and performance of a Permatrim. Installing a Permatrim may seem a bit laborious for someone whom may be unfamiliar with the task, so please feel free to contact us by live chat, email or toll free at 800-213-3323 if you have any questions. It is our goal to have a 100% satisfied customer base and we want to ensure that a Permatrim will exceed all of your expectations.